Widespread privatisation of public goods in many societies is systematically eliminating human rights protections and further marginalising those living in poverty, according to a new report. 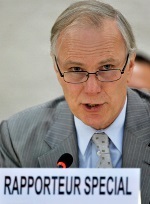 Philip Alston, the UN Special Rapporteur on extreme poverty and human rights, criticised the extent to which the World Bank, the International Monetary Fund, and even the UN itself have aggressively promoted widespread privatisation of basic services, without regard to the human rights implications or the consequences for the poor. He also criticised human rights groups for not responding strongly enough to the resulting challenges. “Privatising the provision of criminal justice, social protection, prisons, education, basic healthcare and other essential public goods cannot be done at the expense of throwing rights protections out of the window,” Alston said. He noted that while “proponents present privatisation as a technical solution for managing resources and reducing fiscal deficits, it has actually become an ideology of governance that devalues public goods, public spaces, compassion and a range of other values that are essential for a decent society. “While privatisation’s proponents insist that it saves money, enhances efficiency, and improves services, the real world evidence very often challenges or contradicts these claims,” Alston said. Privatisation is premised on fundamentally different assumptions from those that underpin respect for human rights, such as dignity and equality, he said. It inevitably prioritises profit, and sidelines considerations such as equality and non-discrimination. Rights-holders are transformed into clients, and those who are poor, needy, or troubled are marginalised or excluded. Human rights criteria are absent from almost all privatisation agreements, which rarely include provisions for sustained monitoring of their impact on service provision and the poor. Human rights actors should start by reclaiming the moral high ground and reasserting the central role of concepts such as equality, society, the public interest, and shared responsibilities, while challenging the assumption that privatisation should be the default approach. “The human rights community needs to develop new methods that systematically confront the broader implication of widespread privatisation and ensure that human rights and accountability are at the centre of privatisation efforts,” Alston said. There appear to be no limits to what states have privatised, he said. Public institutions and services across the world have been taken over by private companies dedicated to profiting from key parts of criminal justice systems and prisons, dictating educational priorities and approaches, deciding who will receive health interventions and social protection, and choosing what infrastructure will be built, where, and for whom, often with harsh consequences for the most marginalised. “There is a real risk that the waves of privatisation experienced to date will soon be followed by a veritable tsunami,” Alston said. Privatisation of social protection often leads to a focus on economic efficiency concerns that aim to minimise time spent per client, close cases earlier, generate fees wherever possible, and cater to those better-off, pushing those with less resources and more complex problems to the margins. The presentation of the thematic report at the General Assembly today was live-streamed in the United Nations Web TV. Source: United Nations Human Rights Office of the High Commissioner.